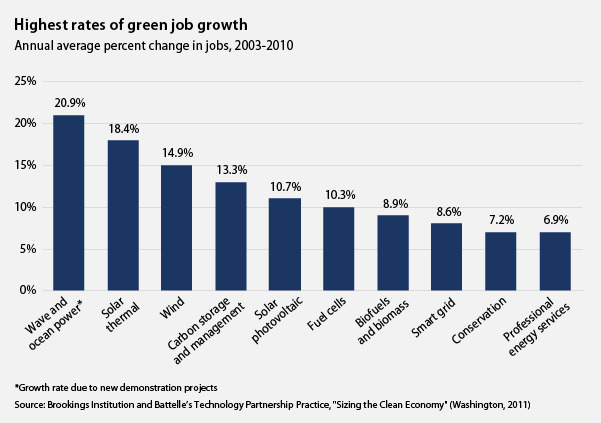 There’s one thing we know for certain about green jobs: They are real, well-paid, and growing. The jobs that make up the clean energy economy are on the rise when jobs in many other sectors are slipping away or moving overseas. With 14 million unemployed Americans, they are a sign of hope in an otherwise stagnant economy. In terms of sheer growth, the clean tech sector glows especially brightly. The July 2011 report “Sizing the Clean Economy” from the Brookings Institution and Battelle’s Technology Partnership Practice makes clear that emerging clean tech sectors saw explosive growth in recent years. In particular, the clean economy sector focused on clean energy—especially wind, solar, fuel cell, smart grid, biofuel, and battery companies—grew far more quickly than the economy as a whole. The Brookings report slices and dices the data in a number of ways. But most striking is the major jobs growth in clean energy between 2003 and 2010: Solar thermal and wind grew by 18.4 percent and 14.9 percent, respectively. Segments with initially very few jobs saw particularly dramatic change over time, though the total jobs in the segment may still be much smaller than in others with a larger baseline. There are currently 2.7 million jobs in the “clean economy,” broadly defined to include both mature and emerging industries across the clean tech, transit, conservation, waste, agriculture, and other clean sectors. The clean economy as a whole—not just the clean tech sectors discussed above—grew by 8.3 percent from 2008 to 2009, in the depths of the recession. This was almost double what the overall economy grew during those years. This is in large part thanks to the Recovery Act. 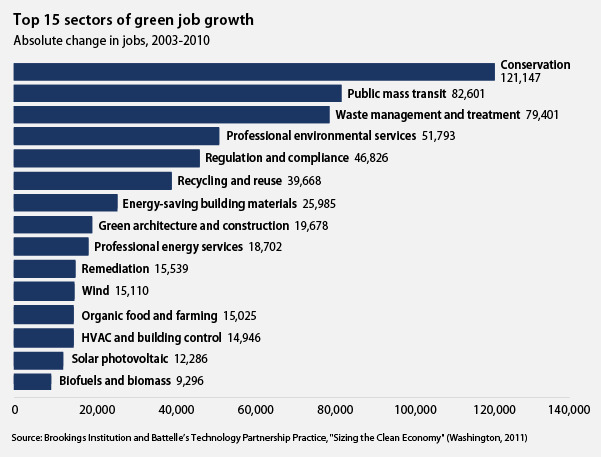 Median wages are 13 percent higher in green energy careers than the economy average. Three separate programs for energy efficiency retrofits employed almost 25,000 Americans in three months since earlier this year. The Weatherization Assistance Program, Energy Efficiency Block Grant Program, and State Energy Programs collectively upgraded over half a million buildings since they began to ramp up earlier this year. These programs mainly hired construction workers, a key point during a time of particularly heavy unemployment in the construction sector. In sum, the clean economy has continued to grow even while industries across America have had to lay off workers or close up shop. Instead of dancing on the grave of those few clean energy companies that do not make it, we need to support the smart growth policies and investments that can create more green jobs while strengthening our greater economy. Kate Gordon is Vice President for Energy Policy, Susan Lyon is Special Assistant for Energy Policy, and Matthew Kasper is an intern with the Energy team at American Progress.